Please select the part you wish to order, enter any additional information, and click the button below. These newly designed short sleeve shirts are form fitting, and made of Coolmax material, the original wicking performance fabric that moves moisture away from the skin, keeping you cool and comfortably dry all day long. 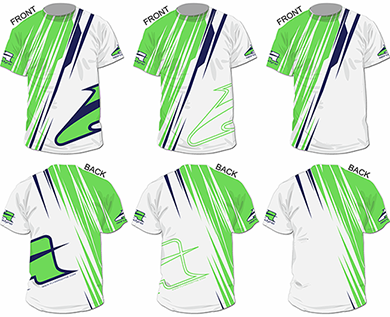 Option 1: With the neon green and navy blue logo. Order one size larger than you would a standard tshirt.